MAY 1 - AUGUST 15, 2009 The Madison Square Park Conservancy continues its 2009 season of Mad. Sq. Art with Flooded Chambers Maid, a site-specific multimedia installation on and around Madison Square Park's Oval Lawn by genre-bending sculptor, painter and installation artist Jessica Stockholder. FLOODED CHAMBERS MAID For more than two decades, Jessica Stockholder has been fashioning a new language for sculpture and installation art, one that applies a painters sense of form, pattern, texture, and color to three dimensional spaces through the use of a staggering variety of media, from heavy duty construction material to mass produced commercial products and even live horticulture. Her sculptural and architectural interventions spread themselves over the spaces they occupy; planes of vivid Technicolor hues about precisely arranged and patterned objects and assemblages of unlikely materials combine and bloom amidst the colorful chaos. Inspired by the interplay of natural and man-made patterns in the design of Madison Square Park and born of an experiential approach to art making, Flooded Chambers Maid, is anchored by a 1300 sq. ft. arrow-shaped platform sprawling across the northern end of the park's Oval Lawn. The platform - a wildly colorful and intricately - patterned combination of custom cut and colored industrial steel and molded fiberglass grating - emerges from a shock of colored rubber mulch to spread itself across the lawn, enveloping a tree and stretching to reach the pathway surrounding the Oval Lawn. The platform's dynamic pop colors, so characteristic of Stockholder's work, spill from the edge of the platform and Oval Lawn across the bordering pathway, leading to an equally colorful staircase and viewing platform installed on one of the smaller adjacent lawns. 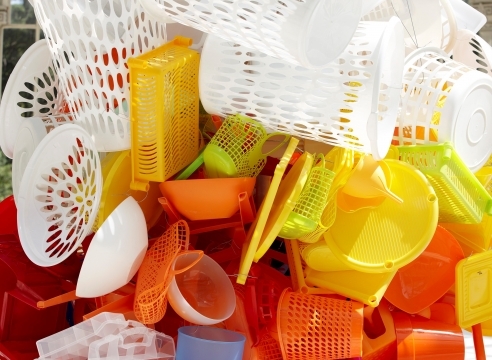 From this elevated perspective visitors are invited to view the installation's garden: swaths of bright flowers and boldly-colored plastic bins and buckets that sweet across the small adjoining lawn in an energetic and ever-changing expanse. 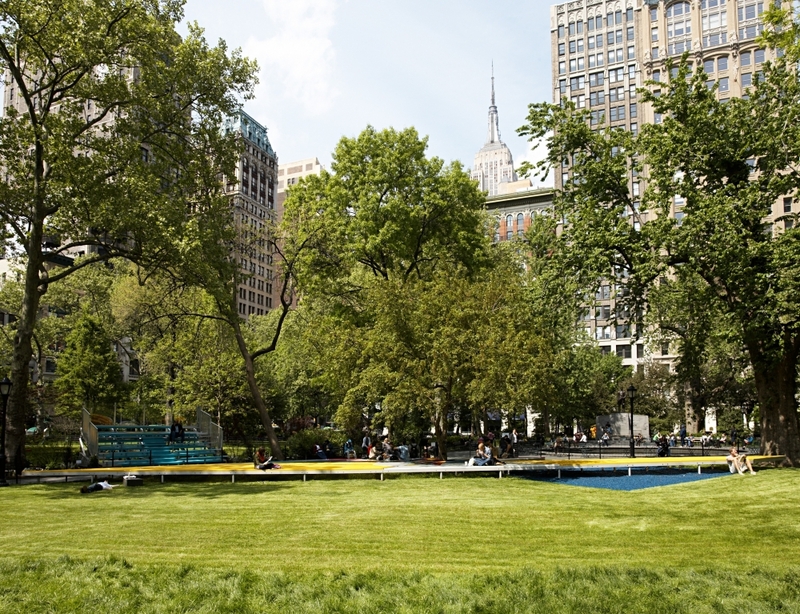 The resulting installation bears all the hallmarks of Stockholder's work while effortlessly embracing both the landscape and ethos of Madison Square Park. Bold, colorful, idiosyncratic and inviting, Flooded Chambers Maid exemplifies the welcoming and playful spirit that has made the new Madison Square Park such a beloved public space.